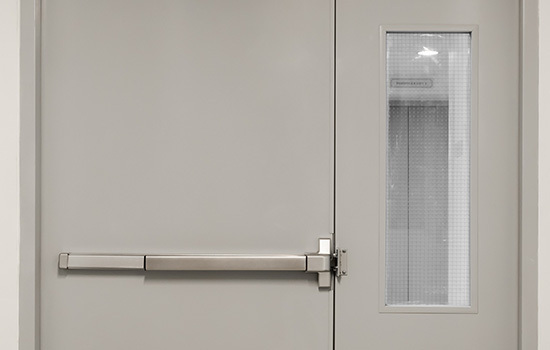 Our full flush metal doors are available in commercial quality carbon steel or A-60 galvannealed steel. Hollow metal doors make a powerful investment, lasting 10 years longer than wood or fiberglass doors. These doors can be rated up to 3 hours. L-Series: honeycomb core, beveled hinge and lock edge door, visible seam on both edges. Available in 14, 16, 18, and 20 gage steel. B-Series: steel stiffened, visible seams on hinge and lock edges. Void areas between the stiffeners are filled with fiberglass. Available in 14, 16, and 18 gage steel. T-Series: designed to meet requirements for temperature rise fire-rated applications. Include same construction features of L-Series doors. Available in 14, 16, 18, and 20 gage steel. CE-Series: decorative doors featuring embossed panels, creating appearance of hand-carved doors. Door includes construction features of L-Series door and is available with half glass, dual vision, or 9-lite design. Available in 16, 18, and 20 gage steel. Grain-Tech: L-Series doors produced using steel sheets embossed to create wood grain appearance. Created from stainless steel and available in six standard colors with ultra violet inhibitor top coat. Stainless Steel: designed to meet and exceed harsh environmental exposures. Similar construction features of L-Series and available in 18 gage stainless steel.